Repco Australian Drift Series Final this weekend, then FD Asia Final next weekend! 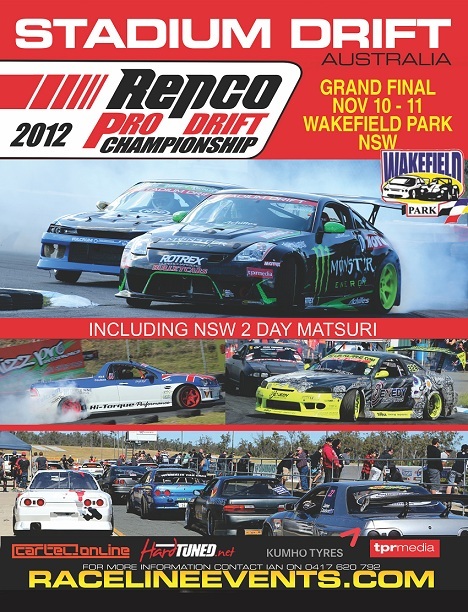 Home » Repco Australian Drift Series Final this weekend, then FD Asia Final next weekend! Another awesome couple of weekends are coming right up and we’re pumped to finish the Repco Series on a high! We’ve spent some time on the Tyreright Sil80 and it’s now all ready to go ahead of the 7th and final round of the Repco Series. We’ve spent some time on the dyno making sure the tune is right. And the new MCA Suspension has a 100% win record since it was installed, so we’re planning on keeping that going. After 6 hard fought rounds we’ll be fighting for the 3rd place in the series. So if you can make it down to Goulburn, NSW it will be worth the trip! If not, there will be a live video feed as well as Facebook updates throughout the event from myself and Stadium Drift, I will update you with all of the links for these in the next couple of days. And a few days after this we jump in a plane and head off to round 3 of Formula Drift Asia at Jakarta, Indonesia! This will be the biggest FD Asia round yet. Some awesome names are coming from all over the world to fight it out with the (unofficially crowned but hard to deny) best drifter in the world, Daigo Saito! More on that very soon, until then STAY SIDEWAYS!